Spiral element consist of membranes, feed spacers, permeate spacers, and a permeate tube. The basic spiral element is a sandwich of flat membrane sheets, known as a ‘leaf’, wound around a central perforated tube. Membrane is laid out and folded in half with the membrane facing inward. The feed spacer is then put in between the folded membranes, forming a membrane sandwich. Purpose of a feed spacer is to provide space for water to flow between the membrane surfaces, and to allow for uniform flow between the membrane leaves. Based on type, the global spiral membrane market has been segmented into polyamide, polysulfone & polyethersulfone (PS & PES), fluoropolymers, and others. In terms of revenue, the polyamide segment accounted for a dominant share of the global spiral membrane market in 2017. Polyamide is projected to expand at rapid pace during the forecast period due to its easy availability and cost-efficiency. The PS & PES segment accounted for a large share of the market. PS & PES imparts strength and high resistance to oxidation and are mostly used in ultrafiltration, and microfiltration. The fluoropolymers segment constituted a large share of the market in 2017. Fluoropolymers have high dissipation factor; therefore, these are not employed in spiral membrane. Based on end-use industry, the global spiral membrane market has been divided into water & wastewater treatment, food & beverage, pharmaceutical & biotechnology, chemical & petrochemical, oil & gas, and others. The water & wastewater treatment segment is sub-segmented into desalination, public, utility water treatment, and wastewater recycle. In terms of revenue, the water & wastewater treatment segment accounted for a dominant share of the global market in 2017. Rapid growth in population and urbanization is fueling the demand for clean water. The food & beverage segment constituted a large share of the market in 2017. The segment is projected to expand at a rapid pace during the forecast period. Pharmaceutical & biotechnology, and chemical & petrochemical segments accounted for substantial share of the market. Pharmaceutical companies use spiral membrane to produce various simple chemical synthesis and complex drugs. Based on region, the global spiral membrane market has been classified into North America, Europe, Asia Pacific, Middle East & Africa, and Latin America. In terms of demand, Asia Pacific dominated the global market in 2017. In terms of value, Asia Pacific was a leading region of the global spiral membrane market in 2017. The region is estimated to continue to dominate the market during the forecast period. Asia Pacific is likely to expand at a rapid pace in the next few years due to the presence of a large industrial base and increase in demand for spiral membrane from water & wastewater treatment, chemical & petrochemical, and other industries. Europe constituted moderate share of the spiral membrane market. According to the European Federation of Pharmaceutical Industries and Associations (EFPIA), the research-based pharmaceuticals industry is growing in Europe. This, in turn, is driving the spiral membrane market in the region. Middle East & Africa holds considerable share of the spiral membrane market. The oil & gas sector is expanding at a rapid pace in Middles East & Africa; therefore, the market in the region is projected to expand at a significant pace during the forecast period. Major multinational corporations with a strong brand presence account for a large share of the global spiral membrane market. Brand image and brand equity play a crucial role in the market. Key players operating in the market include BASF SE, Bayer AG, Syngenta, FMC Corporation, SUEZ, LG Chem, and ALFA LAVAL. Based on type, the global spiral membrane market has been segmented into polyamide, PS & PES, fluoropolymers, and others. In terms of revenue, the polyamide segment accounted for a dominant share of the global spiral membrane market in 2017. Polyamide is projected to expand at rapid pace during the forecast period due to its easy availability and cost-efficiency. The polysulfone & polyethersulfone (PS & PES) segment accounted for a large share of the market. PS & PES imparts strength and high resistance to oxidation, and are primarily used in ultrafiltration, and microfiltration. The fluoropolymers segment constituted a considerable share of the market in 2017. Fluoropolymers has high dissipation factor; therefore, these are not employed in spiral membrane. In terms of technology, the global spiral membrane market has been segmented into reverse osmosis (RO), nanofiltration (NF), ultrafiltration (UF), and microfiltration (MF). In terms of value, RO is a leading segment of the global spiral membrane market and is likely to continue to dominate the market during the forecast period, as it is cost-effectiveness. The NF segment is anticipated to expand rapid pace during the forecast period due to the increase in its use in water treatment applications. The MF segment constitutes a large share of the global market. UF is anticipated to be a less attractive segment during the forecast period, as this technology cannot separate dissolved salts. In terms of end-use industry, the global spiral membrane market has been divided into water & wastewater treatment, food & beverage, pharmaceutical & biotechnology, chemical & petrochemical, oil & gas, and others. The water & wastewater treatment segment is sub-segmented into desalination, public, utility water treatment, and wastewater recycle. Based on revenue, the segment accounted for a dominant share of the global market in 2017. Rapid growth in population and urbanization is increasing the demand for clean water. The food & beverage segment also constituted a large share of the market in 2017. The segment is projected to expand at a rapid pace during the forecast period. Pharmaceutical & biotechnology and chemical & petrochemical segments accounted for a substantial share of the market. Pharmaceutical companies use spiral membrane to produce various simple chemical synthesis and complex drugs. Based on region, the global spiral membrane market can be classified into North America, Europe, Asia Pacific, Middle East & Africa, and Latin America. In terms of demand, Asia Pacific dominated the global spiral membrane market in 2017. 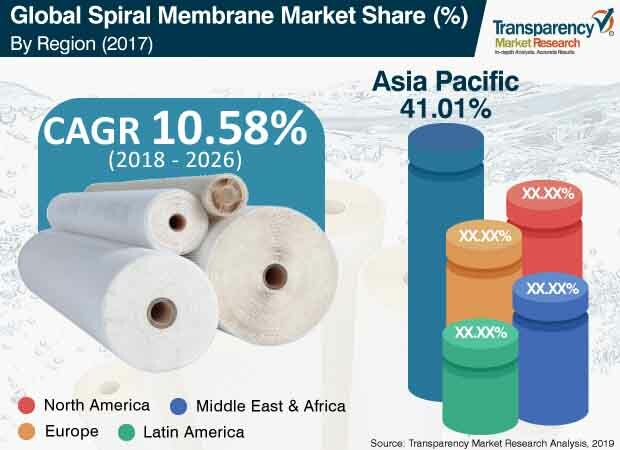 Based on revenue, Asia Pacific was a leading region of the global spiral membrane market in 2017. The region is estimated to maintain its dominance during the forecast period. The market in Asia Pacific is likely to expand at a rapid pace during the forecast period due to presences of a large industrial base and increase in demand for spiral membrane from water & wastewater treatment, chemical & petrochemical, and other industries. Europe constituted moderate share of the spiral membrane market. According to the European Federation of Pharmaceutical Industries and Associations (EFPIA), the research-based pharmaceuticals industry is growing in Europe. This, in turn, is driving the spiral membrane market in the region. Middle East & Africa constitutes a considerable share of the spiral membrane market. The oil & gas sector is expanding at a rapid pace in Middles East & Africa; therefore, market in the region is projected to expand at a significant pace during the forecast period. The report comprises detailed value chain analysis, which provides a comprehensive view of the global pine-derived chemicals market. Porter’s Five Forces model has also been included to help understand the competition landscape of the powder coatings market. The study encompasses market attractiveness analysis, wherein type, technology, and end-use industry segments have been benchmarked based on their market size, growth rate, and general attractiveness. The study provides a decisive view of the global powder coatings market by segmenting it in terms of type, technology, end-use industry, and region. These segments have been analyzed based on the present and future trends. Regional segmentation includes current and future demand for powder coatings in North America, Europe, Asia Pacific, Latin America, and Middle East & Africa. The report covers individual type, technology, and end-use industry segments of the market in every region. The study includes profiles of major companies operating in the global powder coatings market. Large players account for key share of the market. Key players operating in the market include BASF SE, Bayer AG, Syngenta, FMC Corporation, SUEZ, LG Chem, and ALFA LAVAL. Market players have been profiled in terms of company overview, business strategies, and recent developments. The report provides size (in terms of value) of the global powder coatings market for the base year 2017 and forecast for the period from 2018 to 2026. Market numbers have been estimated based on type, technology, end-use industry, and regional segments. The market size and forecast for each type, technology, and end-use industry segment have been provided for the global and regional markets.